COMPOSITES EUROPE is established as an international business platform for the composite industry. It takes place in Stuttgart from 21- 23 September 2017. This year, IKV will again attend Composites Europe with partners from RWTH Aachen University to present some of the latest developments in process technology, design, quality assurance and repair in the field of composites. The Institute's stand will again be located on the "Industry Meets Science" area. 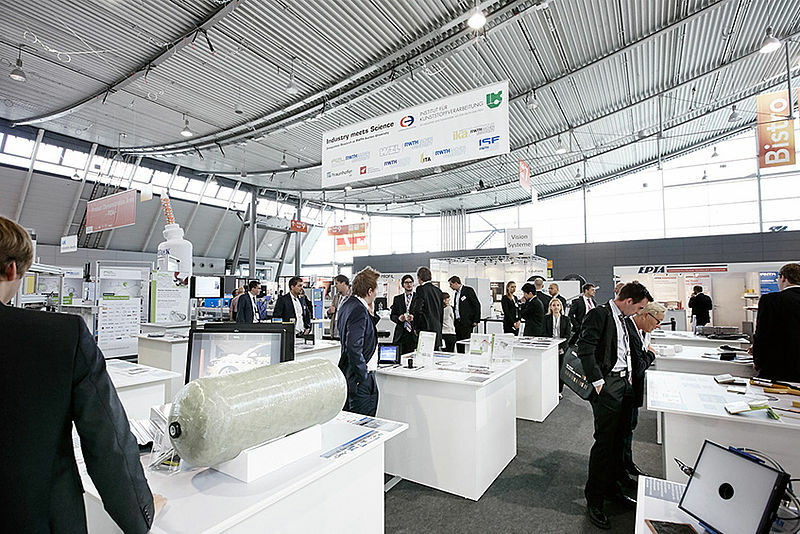 Participating in the project at the CE show will be the AZL (Aachen Centre for Integrative Lightweight Design), the ITA (Institute of Textile Technology), the ika (Institute of Automotive Engineering), the ISF (Welding and Joining Institute), the ILT (Fraunhofer Institute of Laser Technology), the SLA (Institute of Structural Mechanics and Lightweight Design), the IPT (Fraunhofer Institute for Production Technology), and the WZL (Laboratory for Machine Tools and Production Engineering) of RWTH Aachen University. Demonstration parts will be on show, and guided tours to selected highlights will be provided for the visitors. In addition, as part of a lecture session at the COMPOSITES Forum, the institutes will discuss current developments under the motto "RWTH Aachen Composites Research for Next Generation Solutions". Please come and visit us on the "Industry meets Science" area! We look forward to seeing your there!